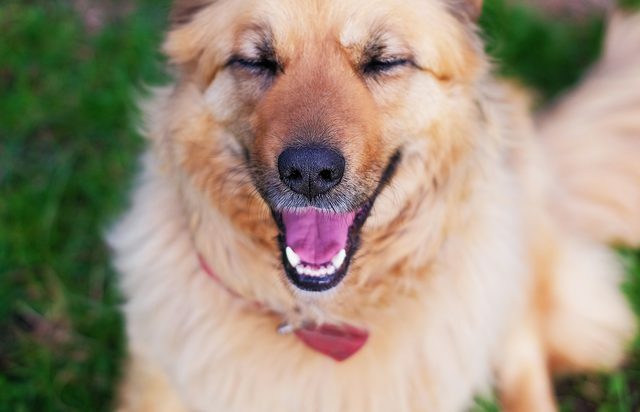 Did you know that dogs can laugh? Hard to believe, right? Findings in the field of Canine gelotology, the study of if and how dogs laugh, show that dogs make a forced breathy sound, usually during playtime that is similar to panting but not panting. What is it? Doggy laughter! Konrad Lorenz, author of Man Meets Dog (1949), writes in his book that dog laughter occurs when the dog’s lips are slack and curled up on the sides of his mouth, accompanied by quick heavy panting. This is the canine equivalent to human laughter and is usually an invitation to play! What do dogs find funny? While it may seem obvious, but nothing makes a dog happier than a loving and attentive owner that provides her with lots of mental stimulation. If you’re trying to make sure your dog is in a good mood, just spend time with him. Aww! Above all else, dogs are going to find their humans the funniest because that’s who they spend the most time with. A magic trick or pretending to throw the ball can be seen as a form of play for your dog. If you perform these acts in love (not maliciously) your dog is sure to think you’re the smartest and funniest guy around. Dogs have always been known to have a sense of humor. Essentially, if you pretend to throw the ball, don’t be surprised if your dog pretends to return it. Oh Fido, such a kidder!